Last winter, I received the $5 Dinner Mom’s Breakfast & Lunch Cookbook, and this was one of the first recipes I tried out in writing my review of the book. This has quickly become one of my favorite cookbooks, and my favorite freezer friendly breakfast. As we prepare to receive our side of beef in the next few weeks, I am busily using up items in the freezer. Today I decided to use up the sausage and cheddar cheese that have been in there. This recipe scales beautifully. I made a triple batch of these with the intention of freezing them for breakfasts for the next 2 weeks. In a large skillet, brown the sausage, crumbling as you cook it. Drain and set aside to cool. In a large mixing bowl, whisk together the dry ingredients. Make a well in the middle, and pour in the eggs, oil and milk. Mix until a batter just forms. Fold in the sausage crumbles and shredded cheese. 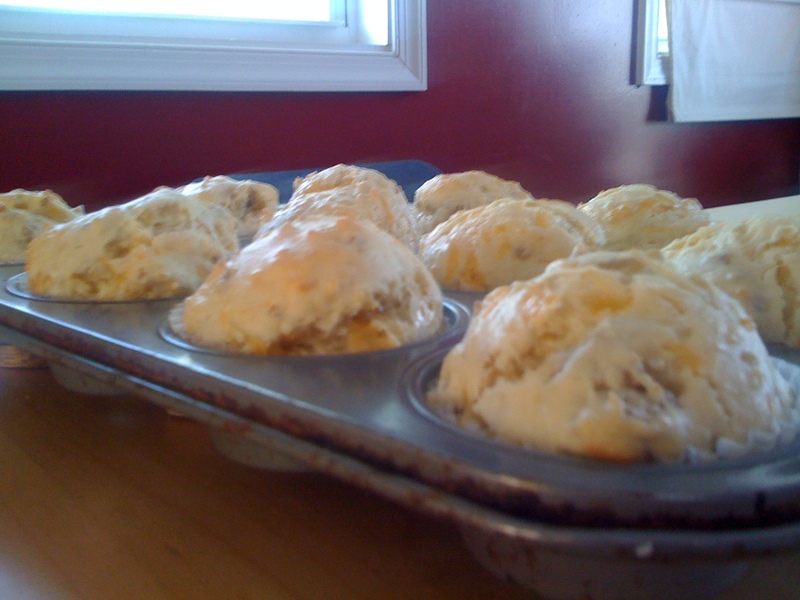 Fill the prepared muffin wells to the top with batter. Bake in the preheated oven for 18-22 minutes, or until they begin to turn golden on top. Serve warm with fresh fruit for breakfast or with soup for a light lunch or dinner. To freeze the muffins, make sure they cool completely, then place in a freezer bag. Place in the freezer. When you are ready to have the muffins, allow to defrost on the counter, and then warm them up in either the oven or microwave.